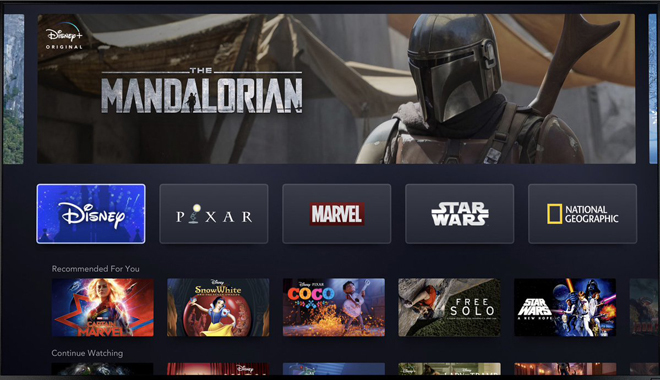 Disney has officially unveiled its Disney+ streaming service. The platform is set to launch on November 12 for a monthly subscription price of $6.99 or an annual subscription price of $69.99. "Disney+ marks a bold step forward in an exciting new era for our company—one in which consumers will have a direct connection to the incredible array of creative content that is The Walt Disney Company’s hallmark. We are confident that the combination of our unrivaled storytelling, beloved brands, iconic franchises, and cutting-edge technology will make Disney+ a standout in the marketplace, and deliver significant value for consumers and shareholders alike," said Bob Iger, chairman and chief executive officer. Disney+ is set to be available on a wide variety of devices, including smart TVs, tablets, smartphones, video game consoles, and the web. Though a full list of supported devices has not been announced, the company did confirm support for Roku and Sony products. Exclusive shows in development for Disney+ include Marvel series focused on Hawkeye, Loki, Scarlet Witch and Vision, and Falcon and Winter Solider; an animated Marvel show titled Marvel's What If…? ; a Star Wars: Rogue One prequel series starring Diego Luna; a second Star Wars live-action show titled The Mandalorian; a Monsters, Inc. show titled Monsters at Work; and a new High School Musical show. Likewise, the service will be home to several original movies and is also expected to house Disney's complete vault of catalog films. And outside of Disney content, Disney+ will also feature several titles from National Geographic and 20th Century Fox, including all 30 seasons of The Simpsons. "We're extremely excited about our growing portfolio of direct-to-consumer offerings. As we demonstrated today, with Disney+ we will deliver extraordinary entertainment in innovative ways to audiences around the world," said Kevin Mayer, chairman, Direct-to-Consumer and International. "We’ll continue to enhance the user experience with a constant pipeline of high-quality programming, making the service even more appealing to consumers."